Yes, it’s that time of year again: time for sports commentators and scholars alike to haul out the category religion when they talk about college football. 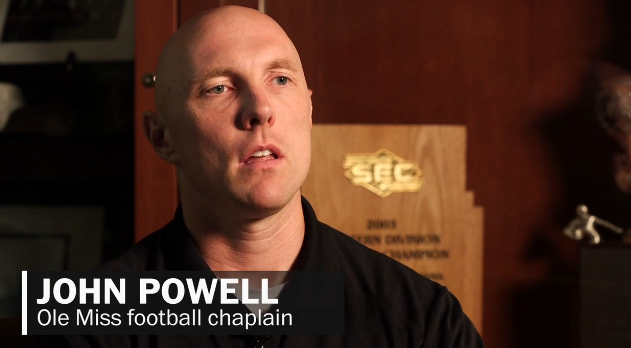 First out of the gate is The Washington Post, with a video story about the voluntary Christian worship ceremonies and counseling — run by the Fellowship of Christian Athletes (FCA) — that is part of the University of Mississippi’s football program. Watch the video and read the article for yourself and see what you think. But what I find interesting is how — speaking as a social theorist who studies religion — none of this is all that big of a deal, for we have long known (if you follow Emile Durkheim and others, that is), that the set of narratives, beliefs, symbols, behaviors, and institutions that we commonly group together and name as religion functions to achieve social cohesiveness and, thus, to create enduring group identity (whatever else participants may think is going on in such settings). So if this is how one approaches the study of religion, then why wouldn’t a football coach want something like this on his team’s side — to help make a collection of individuals into a team? After all, the offensive and defensive lines are likely only as successful as they are knit together — both physically and socially, no? And so, regardless what the participants may feel or say about their experiences, and regardless the other Constitutional issues that may or may not attend this practice, to the observing scholar it makes great sense why some coaches might wish to have this additional move in their playbook. Whether it gives teams a competitive edge or not, or, as coaches report when describing their motives for such programs, helps players’ lives in the long haul, is something that remains to be seen, of course — perhaps someone will submit a grant application to the Lilly Endowment to study that. This entry was posted in Faculty Blog, Relevance of Humanities, Religion in Culture and tagged Church/State, Constitution, Emile Durkheim, football, Pluralism, Social Theory by Russell McCutcheon. Bookmark the permalink.